Mercer Union is delighted to announce that B.W. 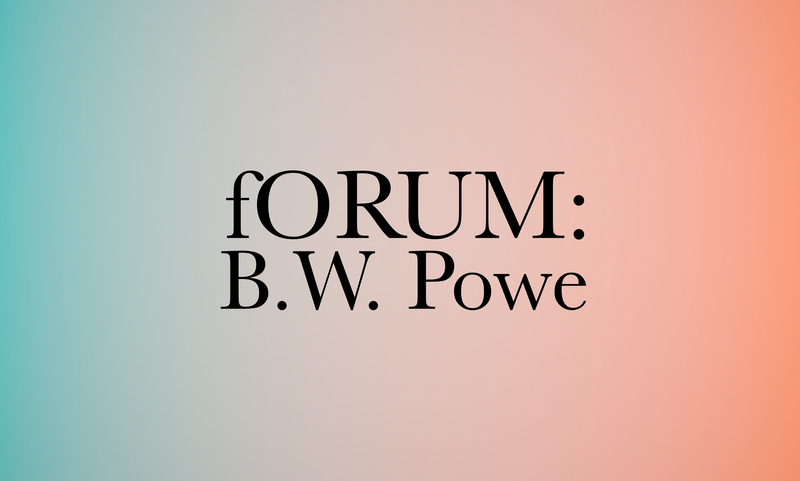 Powe will be the third guest of our fORUM critical conversation series. In his talk B.W. Powe will explore visionary traditions and technologies, focusing on the work of Marshall McLuhan and Northrup Frye and their interest in apocalypse and alchemy. Both looking backwards and forwards, Powe will introduce key concepts in the ongoing collaborative media project, Opening Time: On the Energy Threshold: a multi-text process; involving York University, the University of Catalunya, the University of Basque Country and the University of Milan. B.W. Powe is a philosopher, poet, novelist, and essayist. He is Associate Professor of English Studies at York University and his influential writings on Marshall McLuhan, Northrop Frye, and Pierre Trudeau have been widely-praised, along with his poetry and novels, including Outage and These Shadows Remain (longlisted for the ReLit Prize). His current research focuses on visionary and mystical traditions. He has been involved in literacy initiatives involving both York University and Frontier College and is External Researcher at IN3, Digital Culture, at the University of Catalunya in Barcelona, Spain; a member of the Graduate School of English Literature at York; a fellow of the McLuhan Centre at the University of Toronto and has been an honourary member of the High Table at Massey College. He founded the McLuhan Initiative for the Study of Literacies at York University and has been the program director of the Creative Writing Program at York University. He has written for The Globe and Mail and The Toronto Star; and been featured in the New York Times and on CBC and Bravo: and he has spoken at IDEA CITY in Toronto, and lectured in Spain, France, Italy and the United States. He has two books about to be published: Where Seas and Fables Meet: Parables, Fragments, Lines, Thought, and a new book of poems and images, to be published by Neo Poeisis Press.